Mary continues to speak of God's deeds as already completed, so sure is she that God will deliver. In these last two verses, she speaks of the scope of God's work: Israel, Abraham and his descendants. The promise God makes to Abraham is this "...through your offspring all nations on earth will be blessed, because you have obeyed me." (Genesis 22:18) Israel, the nation, restored, and blessings to come upon all nations. When I reflected upon this passage, the word that shimmered forth was "promise". Sometimes when I do lectio divina, the "shimmer" is a word that attracts, sometimes it's a word that repels. Whatever it is causes me to look closer at why that word or phrase caught at me, and "promise" had both positive and negative echoes. I think this is because I have serious trust issues with God. I mean, I know I'm not supposed to, but when you spend the first half of your life being afraid of God (fear being "fear" and not "awe") and worrying you're not going to measure up -- and by you I mean me -- trust is hard. For a while I couldn't trust God on anything. It all had to be under my own steam and if it was out of my control, so was I. Oddly, I seem to be trusting God better (but not perfectly) on the big things these days, but the little things, the ones that needle and get under my skin? Not so much. And it's not about passively waiting for a miracle to happen. My trust seems to be based on the comfort that God is with me. Whatever happens, God is with me. I'm not alone in this. I don't trust that God will fix things, I trust that God will be there for me as I go through them, and that is a transformative trust, instead of flailing about in my own brokenness and generally making a bigger mess of things. OK, that was probably too revealing. 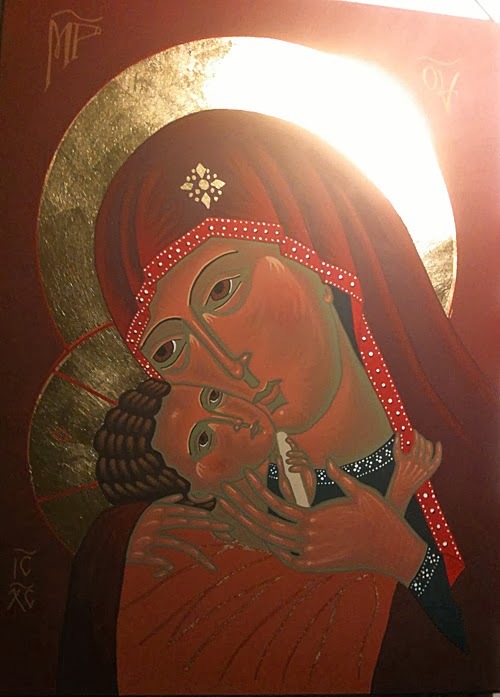 And so when Mary sings of promises accomplished, promises I still see unfulfilled in this world, I need to remember that she is singing of Emmanuel, God With Us (the name's translation). She speaks from a place of confidence because she knows and trusts God is with her, no matter how hard the road is ahead. God is with us is the promise, is the song. If we will only listen, and be transformed by it. This is the last in the Magnificat series. I'll list all the posts tomorrow so if you want to re-read them in order.